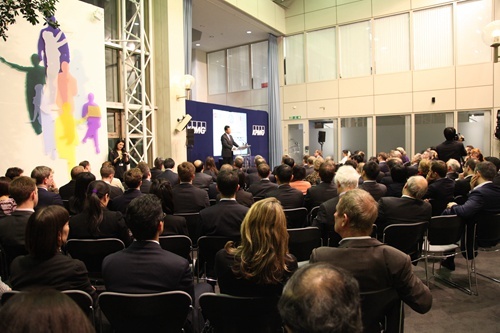 On the evening of December 18, the spacious Atrium of the KPMG Building on Fleet Street, London was brightly lit and filled with distinguished guests. Nearly 300 members of elite from the British parliament, business, financial, education, culture and media circles gathered here for a special speech by a special keynote speaker. 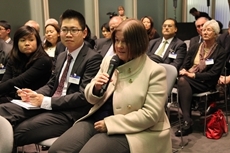 On that evening, 48 Group Club, China-Britain Business Council, Great Britain China Centre and KPMG joined hands for the first time to invite H.E. Ambassador Liu Xiaoming to give a keynote speech on the Third Plenum of the 18th CPC Central Committee. Ambassador Liu Xiaoming had just returned to the UK from accompanying Prime Minister David Cameron on his visit to China. Before the meeting, the guests came with all sorts of questions: As the Third Plenum of the 18th CPC Central Committee held last month launched an unprecedented reform drive, what deployments have been made in the Third Plenum? What new policies have been drawn up? What are the opportunities for the UK, a country located on the western end of Europe? 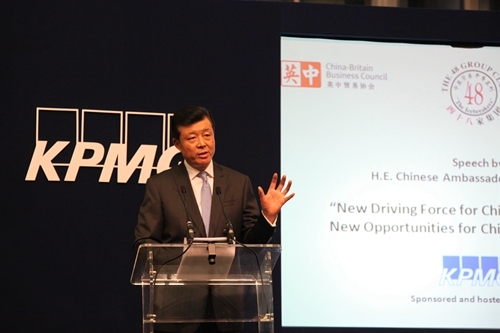 How should the business community and others in the UK grasp these opportunities to enhance cooperation with China? ... With all these questions in mind, the audience expectantly awaited to hear the Chinese Ambassador elaborate on this important Plenum and point to the way to advance pragmatic bilateral cooperation. At 18:20, Ambassador Liu Xiaoming entered the Atrium together with head of global banking from KPMG David Sayer, Chairman Peter Batey of Great Britain-China Centre, Chief Executive Madeleine Sturrock of the 48 Group Club, Chairman Stephen Phillips of the China-Britain Business Council and former FCO Minister of State Lord Howell. Mr Sayer made a welcoming address. He thanked Ambassador Liu for accepting the invitation to deliver this important speech and reviewed KPMG’s development in the Chinese market. He noted that China is playing a more and more important role in an increasingly multi-polarised world. Chancellor of the Exchequer, George Osborne and Prime Minister David Cameron had just made their visits to China and signed many agreements. The economic and trade cooperation between the two countries is facing new development prospects. The measures China has taken in reforming the market economy have attracted world’s attention. He was eager to hear what Ambassador Liu makes of the essentials of the Third Plenum of the 18th CPC Central Committee. 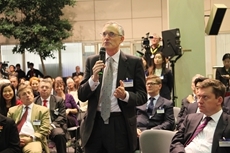 The lecture was moderated by Chairman Peter Batey. He said that the Third Plenum of the 18th CPC Central Committee will serve as an important part in China’s development. The reform measures announced at the Plenum have not only been widely welcomed by the Chinese people, but also drawn positive feedback from the rest of the world. It has been a plenum full of hope that gives a huge new momentum to China’s development. He believed that Ambassador Liu’s speech would familiarize the audience with the Plenum and enhance their enthusiasm for China-UK cooperation. 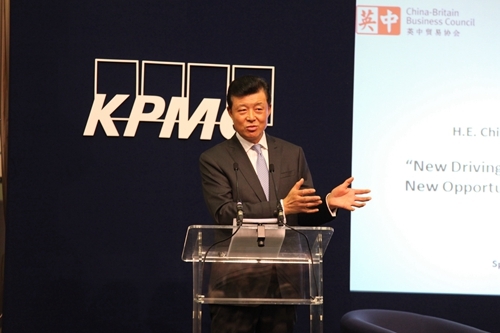 Amidst a round of warm applause, Ambassador Liu Xiaoming began his speech New Driving Force for China’s Development and New Opportunities for China-UK Cooperation. He said most recently he accompanied Prime Minister David Cameron on his visit to China. On his trip, he was greatly inspired by listening to President Xi Jinping, Premier Li Keqiang and NPC Chairman Zhang Dejiang talking about the Plenum session when meeting with Prime Minister David Cameron. 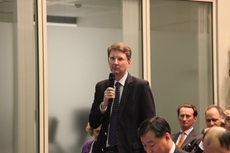 As a result he wanted to take the opportunity to share with the audience his reflections of the importance of the Decisions of the CPC Central Committee on Major Issues Concerning Comprehensively Deepening Reform and Opening Up and its implications for China-UK relations. Ambassador’s unique and amiable opening remarks aroused great interest of the audience. Everyone listened carefully and anticipated for more in-depth analysis. Ambassador Liu then pointed out that the Decisions are a prospectus of China's future reform and opening up. It is a master plan for comprehensive deepening reform. The key to grasp the Decisions is to understand the meaning of “comprehensive” and “deepening”. “Comprehensive” means that the reform has a clear aim and extensive content. While sorting out priorities, the Decisions are both general and specific. The general goals of the reform are to improve and develop a socialist system with Chinese characteristics, and modernize government systems and governance capacity. The Decisions are a panorama of systemic, integrated and synchronized reforms. It requires reform measures to be mutually enhancing and facilitating. Such a synergy will help achieve breakthroughs in key areas while ensuring overall progress. The Decisions have set out more than 300 reform measures to achieve 55 main tasks in 15 areas. The magnitude of the reform is without precedent. As highlighted in the Decisions, the reforms will be both comprehensive and focused, and cover both big and minor issues. The reforms laid out in the Decisions are built on China's reform over the past thirty five years. “Deepening” means further exploration and new breakthrough. Deng Xiaoping famously compared China's reform to “crossing the river by feeling the stones”. At present, China's reform has entered the “deep waters” of that river. As President Xi Jinping metaphorically said: “All the tender meat has been eaten up, what's left now are hard bones.” Therefore, the Decisions state that the government will mobilize all resources to meet the challenges and take on difficulties. We will discard outdated mindsets and break vested interests. China needs to be bold in taking new measures in deepening reform. 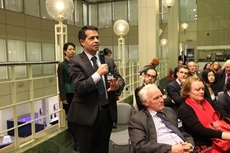 For example, the Decisions for the first time state clearly that the market will play a decisive role in resources allocation; it calls for the reform of the fiscal and taxation system; China should improve its budget management system, improve its taxation regime, and put in place a system corresponding to the division of administrative power and financial power. In China, the general public care mostly about social security reform. In this area, the Decisions stress the need to establish a fairer and more sustainable social security system. The pension schemes of government institutions will be reformed. Basic old age insurance and medical care for the urban and rural population will be integrated. There will also be a gradual extension of the retirement age. Ambassador Liu said that through reform, the Decisions will unleash the potential and add a new driving force for China's future growth. It will also create new opportunities for China-UK cooperation. Next, by integrating the latest developments in China-UK relations, Ambassador Liu introduced the ten new opportunities opened up by the Decisions for China-UK cooperation: market access, two-way investment, free trade agreements, financial cooperation, innovation in science and technology, stronger spending ability, development of central and western China, cultural and people-to-people exchanges, urbanisation, medical and health care. Ambassador Liu’s remarks on the ten opportunities kept the audience thinking. Many of them took notes from time to time. Ambassador Liu finally noted that the Third Plenum marks a new starting point for China. At the same time, the meetings between Chinese and British leaders have also set the sail on a new voyage of the China-UK relationship. As an old Chinese saying goes: “An opportune moment shall not be missed; a good opportunity shall not be wasted.” He said he hopes the British friends, whatever sector they are from, will not miss the moment or waste the opportunity. He hopes they will actively expand exchanges and cooperation with China in all fields. There are immense mutual gains if you ride on the train of China's comprehensively deepening reform. He is sure both countries will enjoy win-win results from China's continuous growth. Let us work together for a better future of China-UK relations. 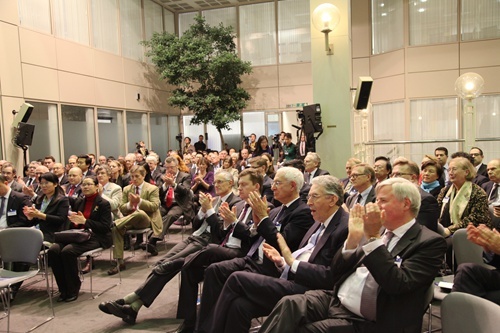 Ambassador Liu’s speech won a warm round of applause from the audience. 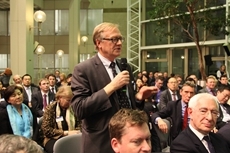 When the speech was over, Chairman Peter Batey announced the beginning of the Q&A session. 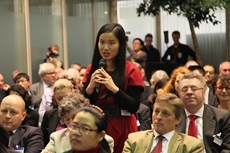 One participant said that the plans of China’s reform are inspiring. But what other challenges or difficulties for China to realise this blueprint? Ambassador Liu said China’s development has entered a new stage. With the reforms in deep water, China is facing more and more complicated and uncertain factors. As the General Secretary Xi Jinping said, “We shall make vigorous yet steady efforts in the designing of reform measures”. One of the biggest challenges is probably how to handle the relationship between reform, development and stability. China is steadfast in pressing ahead with reform. Meanwhile, we are confident and have the ability to handle well the relationship between reform, development and stability and finally turn the grand blueprint described in the Decisions into reality. 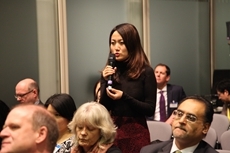 One participant was quite interested in two-way investment asked in addition to acquisitions and portfolio investment when China would have its own enterprises in Britain. Ambassador Liu said two-way investment has developed rapidly in recent years, becoming a major highlight in China-UK cooperation. In the past few years, some Chinese enterprises have purchased some British enterprises. For example, SAIC Motor acquired the British automaker MG Rover to invent a new pattern of “designed in the UK, manufactured in China, assembled in the UK”. Geely Motor acquired the London Taxi Company Manganese Bronze, and Shanghai Bright Food Group acquired Weetabix Food Company. He gives active personal support to two-way investment between the two countries. When having breakfasts during business trips, he would always choose products of Weetabix Food. He believes that as China’s reform and opening up continues to develop, the two-way investment between the two countries will become ever more active. Ambassador Liu’s humorous and vivid reply aroused the light-hearted laugher from among the audience. They could feel the attention and devotion to bilateral cooperation of a Chinese ambassador. 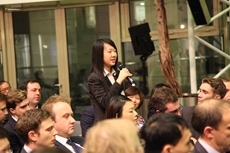 Another participant asked whether Shanghai will replace Hong Kong as an international financial centre. Ambassador Liu said Hong Kong’s prosperity and development is closely linked with the motherland. Hong Kong will continue to benefit from China’s deepened reform and opening up. As an international financial centre, Hong Kong enjoys unique advantages and an irreplaceable position. Shanghai and Hong Kong are not rivals, but rather partners that supplement and promote each other. Ambassador Liu also answered questions about the roles of the central leading group for deepening overall reform, the ‘decisive role’ played by market in resource allocation, decision-making authorities between central and local governments, medical and health system reform, the rural land system reform, urbanisation, social solidarity, wealth gap, RMB internationalisation, IPR protection, China-UK judicial cooperation, China-Japan relations and the situation on the Korean Peninsula. Finally, Lord Howell took the podium to deliver a word of thanks on behalf of the four organisations. He said that Ambassador Liu’s insightful speech and replies were highly encouraging and enlightening. The Third Plenum of the 18th CPC Central Committee was convened at a crucial moment as China modernises and has caught great attention from various circles in the British society. China is fast integrating into the world economy in an all-round way, and the decisions made at the Third Plenum on deepening reforms are of great significance to the UK, Europe and the world. As a major trading nation and energy consumer, China has developed into a decisive force in world economy. In the last century, people often said “all roads lead to the Middle East”. Now, it has been changed into “all roads lead to China”. Currently, the UK and Europe are undergoing adjustment and reforms. We should learn from China’s reforming spirit. We also need a “Third Plenum” to adopt bold reform measures and more effectively respond to employment, growth and youth issues. All circles in the UK should take active action to grasp the opportunities of China’s reform and catch the “fast train” of China’s development. 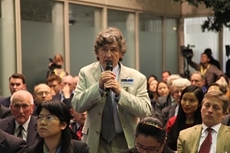 Lord Howell at last saluted the Chinese people and wholeheartedly wished that the Chinese people success reform endearvours and realise the ambitious goal of the Chinese Dream. 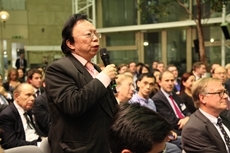 After the lecture, Ambassador Liu was surrounded by the audience who either continued to ask questions or expressed their own opinions. Many listeners said Ambassador Liu’s detailed interpretation of the Third Plenum of the 18th CPC Central Committee has enabled them to understand the trend and direction of China’s deepened reforms. The ten opportunities summarised by Ambassador Liu were not only impressive but also inspiring. They were optimistic about the bright future of China’s reform and willing to seize the opportunities to cooperate with China.